I'm so thrilled that I find a lot of freshly-harvested English peas at Farmers Market lately. Yes, spring is here! 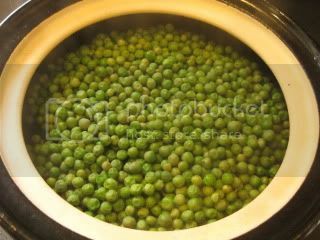 So, I use a lot of English peas as well as pea tendrils in my healthy donabe cooking lately. I think I've made this donabe rice dish 4-5 times in past 2 weeks. It's English Peas and Hijiki Seaweed Brown Rice. I'm basically obsessed with this dish, because it tastes amazing when cooked with my double-lid donabe rice cooker, "Kamado-san". It's very simple to make. I first cook brown rice with hijiki (and water, sake, light-color soy sauce, and salt), and as soon as I turn off the heat, I add fresh English peas to the rice and cook with the carry-over heat (covered). Voila. The beautiful seasonal rice dish is ready. I love the beautiful expression (flavor profile) of these 2 ingredients in this simple rice dish. LOVE LOVE. 1. In "Kamado-san", combine the rice with water, sake, soy sauce, sea salt and let the rice soak for 20-30 minutes. 2. Spread hijiki seaweed on top. Cover with both lids and cook over medium-high heat for 13-15 minutes (I turn off the heat 2 minutes after steam starts puffing). 3. Turn off the heat. Quickly uncover and add English peas. Quickly cover again and let it rest for 20 minutes. 4. Uncover and fluff the rice mixture. Serve into individual bowls. 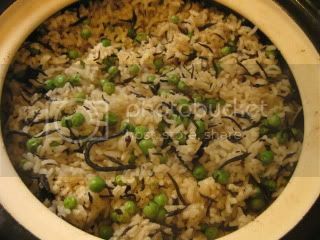 You can also find my even simpler and more straight-forward English pea rice recipe ("Mame Gohan") on toiro's website.